The vehicle identification number can be read from outside the vehicle through a viewer in the windscreen . The viewer is located in the lower corner of the windscreen. 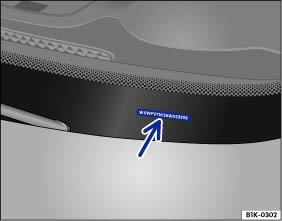 The vehicle identification number is also stamped on the right-hand water drainage channel. The water drainage channel is located between the suspension turret and wing. You have to open the bonnet to gain access to the vehicle identification number . The vehicle identification number can be displayed in the infotainment system using the button and the and Service function buttons . Engine and gearbox code, paint number, interior equipment. In the example, the engine code is CPTA . These vehicle data are also contained in the service schedule. The type plate B can be seen on the lower part of the door pillar when the door is open. Vehicles for certain export countries do not have a type plate.